Canal rays are positively charged radiations. These rays consist of positively charged particles known as protons. They were discovered by Gold stein in 1886. Since an electron is a negatively charged particle and the proton, a positively charged one, the net charge becomes neutral as both the particle neutralises each other. 1.On the basis of Thomson’s model of an atom, explain how the atom is neutral as a whole. An atom consist of a sphere of positive charge with negatively charged electrons embedded in it.The positive and negative charges in an atom are equal in magnitude, due to which an atom is electrically neutral.It has no overall positive and negative charge. On the basis of Rutherford’s model of an atom, protons (positively-charged particles) are present in the nucleus of an atom. If the α-scattering experiment is carried out using a foil of a metal rather than gold, the observation would remain the same. In the α-scattering experiment, a gold foil was taken because gold is malleable and a thin foil of gold can be easily made. It is difficult to make such foils from other metals. The three sub atomic particles of atom are electrons, protons and neutrons. 1 Write the distribution of electrons in carbon and sodium atoms? 2 If K and L shells of an atom are full, then what would be the total number of electrons in the atom? the atom would be (2 + 8) = 10 electrons. The electrons present in outermost shell of an atom are called as valence electrons.The combining capacity of an atom of an element to form chemical bond is called its valency. 2)Equal to the number of electrons required to complete eight electrons in valence shell. (i) what is the atomic number of the atom? 1. For the symbol H,D and T tabulate three sub-atomic particles found in each of them. Isotopes are the atoms of same element having same atomic number but different mass numbers. 29Ca40 and 18Ar40 are pair of isobars. The electronic configuration of 40Ar18 is 2, 8, 8.
charged Proton are positively charged. Neutron are neutral. nearly equal to the mass of a proton. J.J. Thomson in 1904, proposed that an atom was a sphere of positive electricity in which were embedded number of electrons. The stability of the atom was explained as a result of the balance between the repulsive forces between the electrons and their attraction towards the centre of the positive Sphere.This model could not explain the reason for exact stability of the atom. He does not explain the stability of an atom.In the Rutherford’s model of an atom, the negatively charged electron revolves around the positively charged nucleus in circular path.If an object moves in a circular path, then its motion is said to be accelerated.This means that motion of an electron revolving around the nucleus is accelerated.If a charged particle undergoes accelerated motion, then it must radiate energy continuously.Thus the energy of revolving electron will decrease gradually and their speed will also go on decreasing.And ultimately the electrons should fall into the nucleus.This makes atom very unstable and hence the atom should collapse. 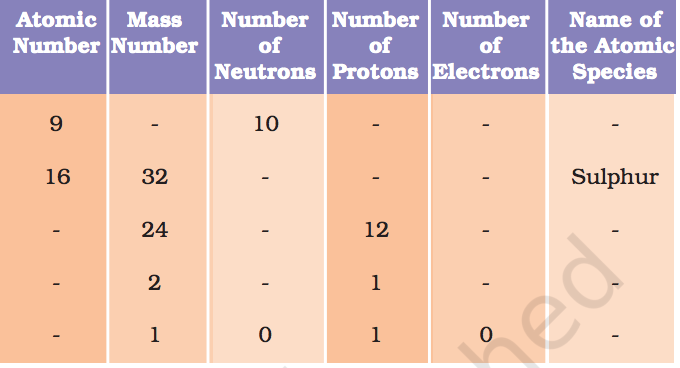 1) An atom is made up of three particles: electrons, protons and neutrons.Electrons have negative charge, protons have positive charge whereas neutrons have no charge.Due the presence of equal number of negative electrons and positive protons, the atom on the whole is electrically neutral. 2)The protons and neutrons are located in a small nucleus at the centre of an atom.Due to the presence of protons,nucleus is positively charged. 4)The first energy level or k shell can hold maximum of 2 electrons. The second energy level or L shell can hold maximum of 8 electrons. The third energy level or M shell can hold maximum of 18 electrons. The fourth energy level or N shell can hold maximum of 32 electrons. 5)Each energy level or shell is associated with fixed amount of energy.There is no change in energy as long as they keep revolving in same energy level. An atom consists of a positively charged particles concentrated at the center known as the nucleus. The electron revolve around the nucleus in well – defined orbits. 6. Summaries the rules for writing of distribution of electrons in various shells for the first eighteen elements. The arrangement of electrons in various energy levels or shells of an atom is known as electronic configuration of the element. Electrons in an atom do not occupy a new shell unless all the inner shells are completely filled with electrons. 7. Define valency by taking examples of silicon and oxygen? The outermost electron shell of an atom is called valence shell. The electrons present in outermost shell of an atom are called as valence electrons. The combining capacity of an atom of an element to form chemical bond is called its valency. (iii) Isotopes and iv) Isobars. Give any two uses of isotopes. The atomic number of an element is the total number of protons present in the atom of that element. For Ex: Atomic number of sodium is 11. For ex: The atom of boron has 5 protons and 6 neutrons. So, the mass number of boron is 5 + 6 = 11. 1) An isotope of Uranium is used as a fuel in nuclear reactor. Atomic number of Na is 11.Its electronic configuration is 2,8,1. The electronic configuration of Na+is 2,8. The above configuration indicates completely filled K, L shells. 10. If bromine atom is available in the form of, say, two isotopes 79Br35 (49.7%) and 81Br35 (50.3%), calculate the average atomic mass of bromine atom. 11. The average atomic mass of a sample of an element X is 16.2 u. What are the percentages of isotopes 16X8 and 18X8 in the sample? Atomic number of element is 3.Its electronic configuration is 2,1.The valency of element is 1.Therefore the element is Lithium. These two atomic species X and Y have the same atomic number, but different mass numbers. 14. For the following statements, write T for True and F for False. (a) 2,8 (b) 8,2,1 (c) 2,1,8 (d) 2,8,1.